GCSEs are changing – in Wales, and elsewhere in the UK. It’s important that GCSEs continue to be both rigorous and relevant for today’s learners while meeting the needs of Colleges, Universities and employers. That’s why, following a review by Welsh Government of qualifications for 14-19 year olds, a new set of GCSE qualifications are being introduced in Wales. What is changing in Wales? The new qualifications are being rolled out over a period of three years between 2015 and 2017. The first wave of subjects to be reformed and taught from September 2015 were Mathematics, Mathematics–Numeracy, English Language, Welsh Language, English Literature and Welsh Literature. Learners will be completing their tow-year courses this summer (2017). The second wave of reformed qualifications were introduced in September 2016 and will be completed in Summer 2018. The third and final wave of reformed qualifications will be taught from September 2017. For more details, please visit the Qualifications Wales website. What is happening in other parts of the UK? These changes are not taking place in Wales alone. GCSEs in England and Northern Ireland are also being reformed. This means that in future there will be some differences in the GCSEs awarded in each of these three countries. One of the most noticeable differences will be in the grades that learners receive. 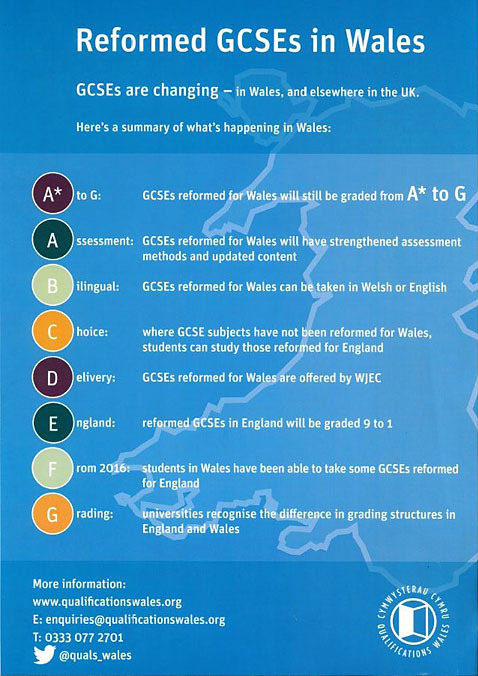 GCSEs reformed for Wales will keep the A* to G grades, whereas reformed GCSEs in England will move to a system of grading on a scale of 9 to 1. It’s important to remember that these changes will not affect the value of GCSEs in Wales. The value of GCSEs taken in Wales will remain comparable to those taken in England and Northern Ireland. While there will be some differences in the content or the assessment methods used within subjects, the qualifications taken in all three countries will continue to be of the same size and accessible to the same range of learners as those they replace. On this website you will also find information about the changes being made to AS and A level qualifications.